তাৰ পিছত দেখিব, আপোনাৰ চুলিখিনি তিতি গৈছে ! ছোৱালীহঁত তোমালোকে কি কৰি আছা ? দিনবোৰ দেখোন তোমালোকতকৈও Hot হৈ গৈ আছে ! 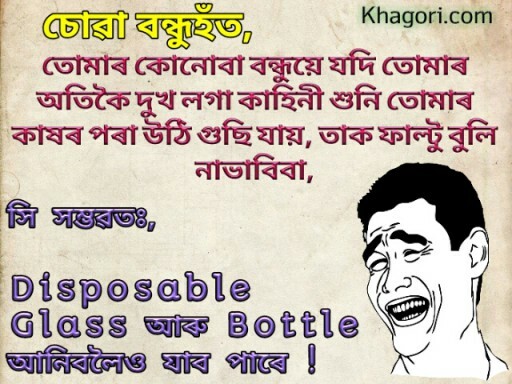 Disposable Glass আৰু Bottle আনিবলৈও যাব পাৰে ! Eta tamor okonman dangor patro lobo. Borokhunor pani pori thokakoi patroto khola thait khojotone rakhibo. Dekhibo patrotot lahe lahe borokhunor photphotiya tanda pani bhorti hoboloi dhorise. Patroto enedhorone rakhibo jate panir bhorot e hali pori najay. Tinidin ekerahe kheidore patroto rakhi dibo. Tinidin ukoli juwar pisot, soturtho dinakhon ukto patroto khabodhane loi ahibo. Tar pisot okono polom nokori bathroom loi goi prothomote gato bhaldore tiyay lobo. Etiya patrotot itimodhye joma hoi thoka panikhini aste aste dhire dhire sulikhinit ba sulikosat tetiya loike dhalok jetiya loike patrotor khomosto pani khekh hoi najay. Tar pisot dekhibo aponar sulikhini titi goise ! Golot eta nemu aaru khat ta jolokiyar mala edalo olomai rakha. Suwalihot tumaloke ki kori aasa? Dinbor dekhon tumalotkoi o hot hoi goi ase ! Disposable Glass aaru Bottle aaniboloi o jabo pare ! 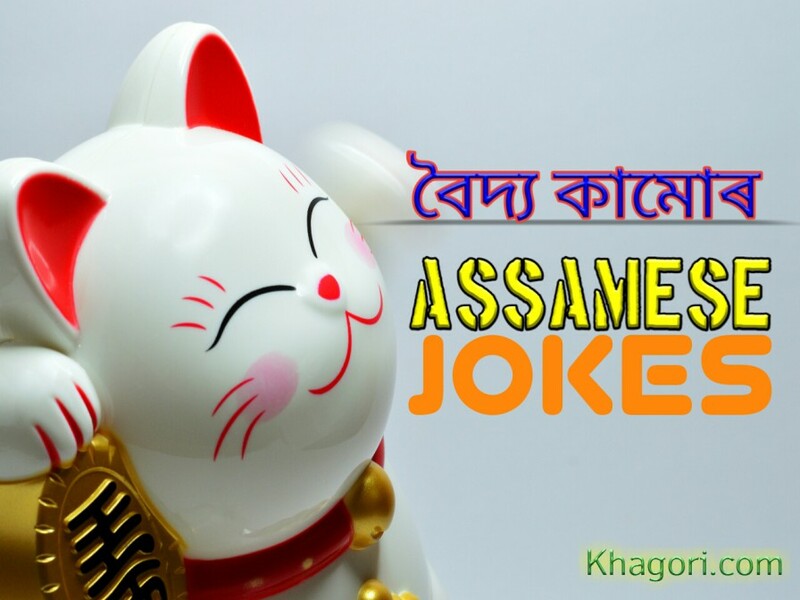 Viewers, Do you like these "Assamese Girl Jokes 2018" and " Baidhya Kamor Assamese Jokes". Kindly expess your thought to our comment section just below to the post. I always try to publish some selected standard Assamese Jokes. These best jokes are only for you viewers. Please Like and Share the post. Your support makes me motivated to do so. I am trying to do the best only for you viewers. Thanks keep visit.